Tom Bleier and Bob Camins recently travelled to Banda Aceh, Indonesia, the site of the 2004 M9 earthquake and tsunami which killed over 200,000 people along the western coastline. During this trip, we received excellent support from partners Dr. Teuku Reza Ferasyi from Syiah Kuala University, and from Aidil Adhari, the local Tower Bersama (cell tower company) representative who helped us install the instruments inside their cell tower security enclosures. 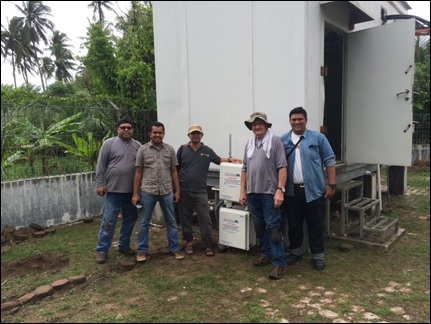 We installed instruments near Banda Aceh and every 40 km southward along the coastline, facing the famous subduction zone fault line. The installations were difficult due to heavy rain and high temperature/humidity, but the team of QuakeFinder, Syiah Kuala University, and Tower Bersama worked really well together to get the job done on time. In addition to the in-country team, many thanks are due to the “home” team, including Clark Dunson, who handled several midnight calls for support back in the Bay Area, and Jim Lemon, who kept a vigilant eye on the status of systems after they were installed. The Banda Aceh area is calm now and does not show much of the damage and heartbreak from the 2004 tragedy. We hope this joint effort for earthquake forecasting research will help to lessen the loss of life from future earthquakes.